It was only a drill, but dozens of first responders were put to the test Tuesday to make sure they're prepared in the event of a major disaster. VERO BEACH, Fla. — It was only a drill, but dozens of first responders were put to the test Tuesday to make sure they're prepared in the event of a major disaster. The scenario Tuesday at the Vero Beach Airport involved a man who didn’t want his family to leave, so he drove out onto the airport tarmac and crashed into a plane they were on board. Within minutes, Fire Rescue and police were on scene, putting out a fire coming from the vehicle and tending to the victims, played by Indian River Charter High School students. "This is as close as they get to the actual experience so we want to make it as real as possible," said Sarah Castillo, who sported a fake head wound. This drill comes just days after first responders had to deal with two actual emergencies here and around the airport. On Friday, a plane crashed behind the Indian River County Sheriff’s Office. No one was hurt. Then on Saturday, crews had to put out an engine fire on a plane that had just landed. "It was like a precursor to what we had this morning with all the other agencies we needed to contact to make aware," said Battalion Chief Roger Dion, who responded to Saturday's fire. A $1.2 million mobile aircraft fire trainer at the airport adding to the realism. 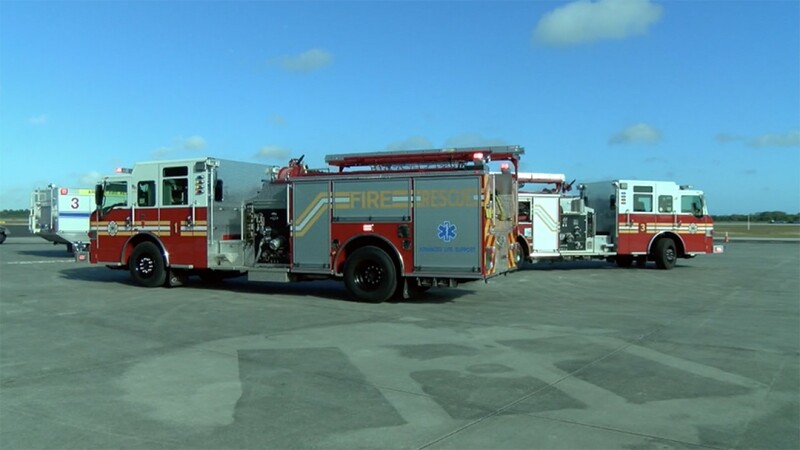 "Mobile aircraft fire training allows firefighters to train at their home airport with their own equipment," said Bruce Bjorge, an aircraft fire trainer Program Specialist. "Even though I knew it wasn’t real, I still felt like it was," said Indian River Charter High School senior Willie Burt. A drill like this is required every three years by the FAA.